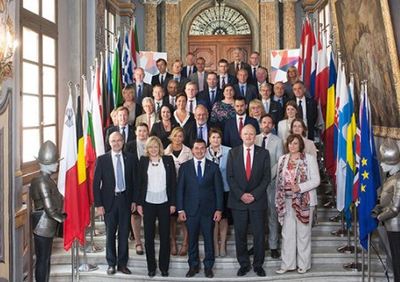 The CPMR took part in the informal ministerial meeting of Ministers responsible for Cohesion Policy in Valletta on 9 June, at the invitation of the Maltese Presidency. This high-level event gathered delegations from the 28 EU Member States and EFTA countries, as well as the chair of the Regional Development Committee of the European Parliament, Iskra Mihaylova, and Commissioner for Regional Policy Corina Creţu. CPMR Vice-President and President of Tuscany, Enrico Rossi, and CPMR Secretary General, Eleni Marianou, had the opportunity to speak during this closed-door meeting to represent the interests of its 150 regional Members. Moreover, this meeting with national-level representatives gave the CPMR the opportunity to warn about the risks of misuse of the policy in the next programming-period. “Cohesion policy is a EU policy, supporting regional development, not a Member State instrument of macro-economic conditionality,” said Vice-President Enrico Rossi. The main purpose of the meeting was to discuss on ways to bring Cohesion Policy closer to European citizens in the future. In light of the challenges surrounding this policy, in particular the likely losses in budgetary resources, Member States and Commissioner Corina Creţu exchanged views on its future policy framework. They unanimously stressed the need to develop a performance-based approach for Cohesion Policy, focused on tangible results that can be effectively communicated to EU citizens. It was agreed by participants that Cohesion Policy post-2020 should continue to cover all European regions in the future, but with a more differentiated, tailor-made approach between territories to maximize its efficiency.